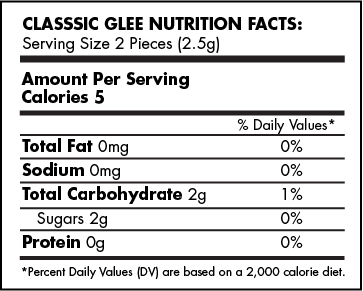 Classic Glee is sweetened with Fair Trade cane sugar and brown rice syrup. .
CANE SUGAR, GLUCOSE, GUM BASE (CONTAINS NATURAL CHICLE), BROWN RICE SYRUP, NATURAL CINNAMON FLAVOR, GUM ARABIC, RED BEET COLOR, RESINOUS GLAZE, BEESWAX, AND CARNAUBA WAX.